← VIDEO: TESTING THE NOEL GUARD TO KEEP OUT RACCOONS. PAINTING POLES AND BAFFLES, DEALING WITH WEEDY GROWTH, AND FLEDGING BABY BIRDS. I really like this setup–and so do the nesting birds. This is an Eastern Bluebird nest in progress. Wahoo! Once the weedy growth was mowed farther away from this setup, the bluebirds returned–a very successful nestbox again for 2013. LIke my paint job? Would you believe I painted the conduit and the stovepipe AFTER this nestbox was already installed? How? Very carefully, when birds were not using it, and taping small pieces of newspaper all over the nestbox, that’s how! See this post on materials used, including the primer info. Yes, I primed the galvanized stovepipe, and then spray painted. I’m pretty happy with the results so far. In these photos, one Noel Guard is unpainted galvanized 1/2″ hardware cloth (looks grey) and the other is vinyl-coated green 1/2″ hardware cloth. I like the vinyl-coated best. Please also note I am experimenting with different designs of stovepipe baffles — the Ron Kingston (most effective (!) using hardware cloth inside the stovepipe and an 8″ width), and the less wide 6″ stovepipe baffle with a duct cap at the top. I’m keeping notes as I see effectiveness for both designs. I’m also trying the 7″ width on my trail. Nonetheless, please USE something to deter ground predators. Raccoons and Black Rat Snakes, even mice, can climb smooth conduits and even PVC slipped over conduits. If you grease them, whatever the grease you use, becomes ineffective in time, so you have to keep that up. I cannot keep that up with 34 nesting sites. I do NOT grease any of these stovepipe designs. I will check back at the end of the nesting season to report my findings if any predators got past any of the designs. It can happen, yes…..they are not 100 percent foolproof…….but 99 percent isn’t too shabby of a record! 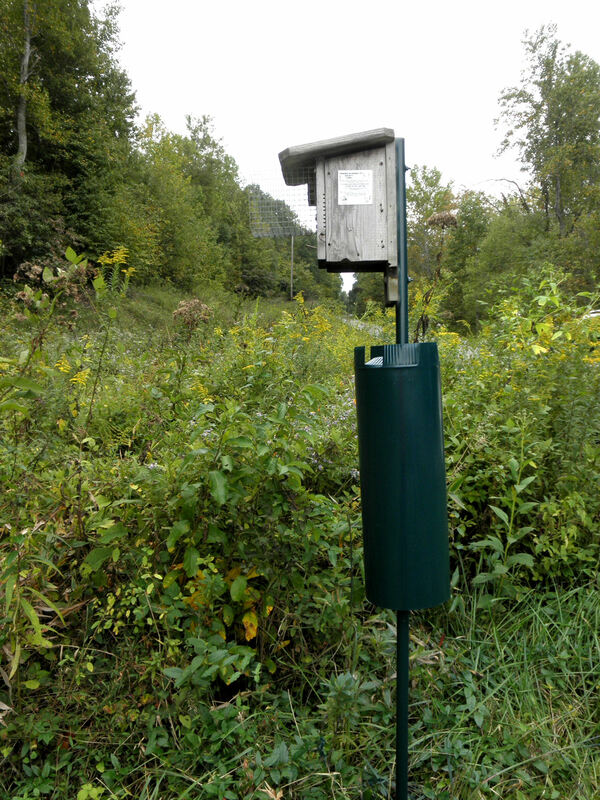 All bird species using the nesting boxes on my trail do not mind entering the nesting boxes and actually like the Noel Guard–this is what makes me the happiest (and gives me peace of mind using the guards). I know the extra effort is helping them, but I don’t want to take the time to install nesting sites like this and monitor weekly and find failure–that’s wasted effort, in my humble opinion. When I visit the boxes, I want to put in my notebook “FLEDGED” and then send on those records to the Virginia Bluebird Society, the North American Bluebird Society (gets the data from the affiliate bluebird clubs from each state), and Cornell’s NestWatch, which I participate, as well. I’m pretty busy these days. I need to be sure I get my rest. Keep boxes a minimum of 125-150 yards apart. If nesting bluebirds are harassed by Tree Swallows , or more than 50% of bluebird trail boxes are occupied by swallows, set up a second, “paired ” box 5-20 ft. from the first. Boxes that Tree Swallows nest in should have ” kerfs ” or grooves (saw marks about 3/4″ apart) or 1.5-2″ wide x 6″ long plastic screen (gutter guard) stapled tightly inside below the entrance hole to enable fledglings to exit. My boxes are spaced at a minimum of 100-150 yards …or much more spacing than that. I have tree swallows at one location this year….and it’s paired wider than 20 feet. All my boxes have grooves on the inside (the roof is always “kerfed”, which means it’s cut at an angle to keep water from driping back down into the wood). I don’t need to add any hardware on the inside of the box under the entry hole because of the 6 grooved lines for tree swallow nestlings legs and feet to hold onto. The tree swallows I had this year fledged. Thanks for the suggestions. Please follow this link to get woodworking instructions for a birdhouse preferred by Western Bluebirds & Mountain Bluebirds . 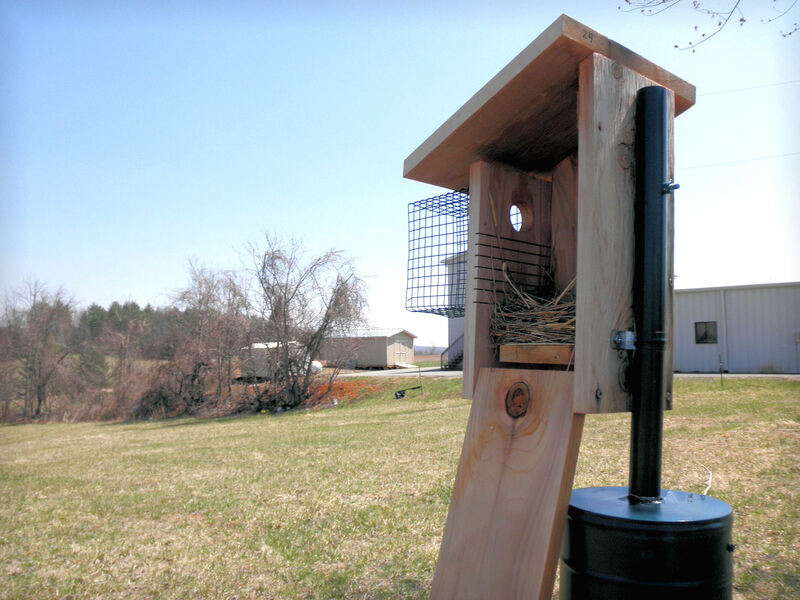 In areas where the Eastern Bluebird range overlaps that of the Mountain Bluebird, use this nestbox which will accommodate all three bluebirds. Thanks for your suggestion but no link was attached. I also am starting to use more two-hole mansions designed for Western Bluebirds (Linda Violett)…a “defensible” nestbox so the bluebirds have an escape route in the event of a House Sparrow attack inside the nestbox.